One of the biggest challenges a music writer can face is writing about a band you adore. Sometimes you like something so much that the task of describing it is an overwhelming pressure. You want to do it justice, you don’t want to over-sell it, but you want to convey just what makes it so fantastic. Sometimes all that comes out of your mind is a jumble of generic positivity (which, if you ask me, is more the reason behind the hyperbolic tendencies of the blogosphere than anything else). This week, I attended my sixth and seventh Yeasayer shows – all within the past two years. I’ve seen the psych-pop-folk-rock outfit from Brooklyn more times than any other band in those years, and although they’ve completely shown-up every band they opened for (MGMT, the National, Man Man) or played with (Amazing Baby, Suckers), I only wrote about one of those shows. There’s a reason for this, and that reason is the challenge of describing what I like about Yeasayer in anything other than hyperbole. There’s also the fact that once you cross a certain line, it can be difficult to still play the critic. When tickets for the Bowery Ballroom & Music Hall of Williamsburg Odd Blood release week shows went on sale, I was on a bus to Boston. Having acquired Yeasayer tickets in the past with no problem, I figured I would order them when I arrived in Boston three hours later. By the time I arrived, the shows had sold out. The album hadn’t even leaked yet, but their reputation had clearly been fueled by Dark Was The Night track, “Tightrope,” and the Odd Blood single, “Ambling Alp.” But the resilient heart does not give up so easily. 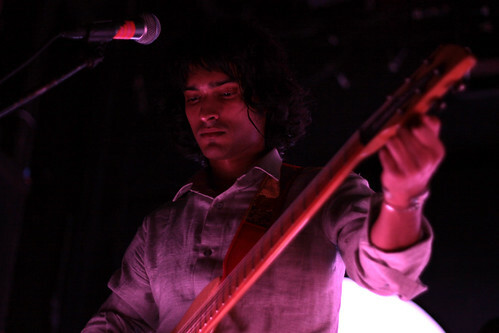 Odd Blood was my most anticipated album of 2010, and I was determined to see Yeasayer play on this tour. Monday night I arrived at Bowery Ballroom early on the chance there would be a few extra tickets, and gloriously, there were. I drank a beer in quiet celebration. I met a nice guy who traveled up from Tennessee to see Yeasayer both nights. Openers Bobo were more gimmick than band. Wearing matching outfits of yellow turtlenecks, overalls with cutouts showing fake body parts, and foam tails, they sang about genies, cops, adventurous kids & cupcake companies. At the very least, though, they were amusing – every audience member had a smile on their face. Mid-show entertainment was Light Asylum, whose set-up comprised an insane amount of cords and plug-ins. 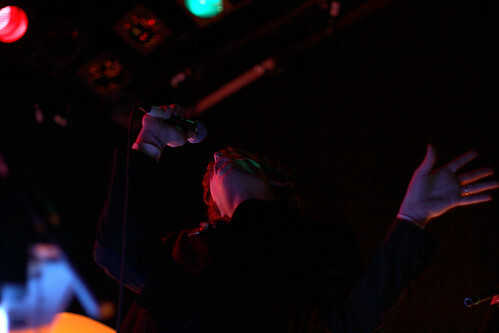 Their haunting electronic gems were more akin to a Kraftwerk kind of stream than a Yeasayer. 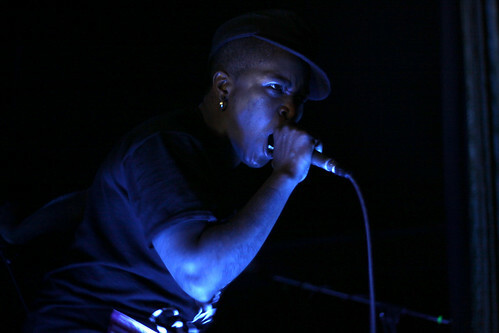 The real driving force was the voice of Shannon Funchess, mastermind behind Light Asylum, and possessor of some real power-house, deep, booming vocal chords. 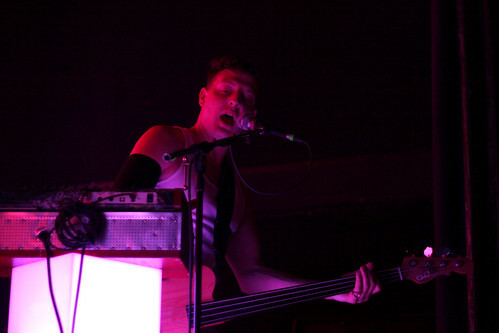 Owning up to their standard classification as a psych band, Yeasayer took to the stage amid an impressive light display. For their last tour, it was glowing orbs, this time, it was a four-piece backdrop, and light-up pedestals. 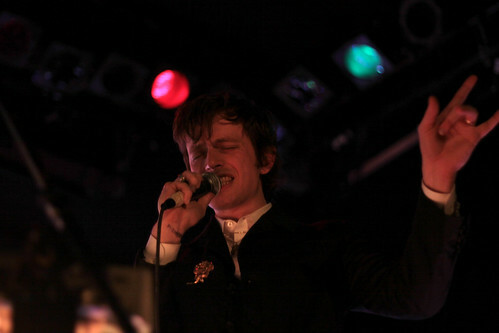 They opened with “The Children,” Odd Blood‘s rather controversial first track. In previous interviews, the band has mentioned a two-step approach to their music: They create the music in the studio, and then they work out the best way to recreate it live. This shows through immediately; “The Children,” which has no discernible guitar on the album, was lead by Anand Wilder’s guitar in the live setting, giving it a warmer, more organic feel. This approach breathed life into some of Yeasayer’s less accessible tracks. “Love Me Girl,” which begins Odd Blood’s odd second half, was pushed to its R&B dance jam heights, complete with smooth dance moves from smooth-voiced Wilder. Mid-set the band transitioned into older material – “Wait For The Summer” and “Sunrise” from All Hour Cymbals, and “Final Path,” a popular b-side. It’s hard to tell with the three year time period between albums, but either the earlier songs were given a more stripped down treatment, or just seemed simpler in comparison to Yeasayer’s complex new direction. Chris Keating retains his entertaining as ever spastic moves and facial contortions, and co-lead vocalist Wilder seems to have picked up on some of Keating’s stage charisma in the process of taking a more prominent vocal role on Odd Blood. While the show at Music Hall of Williamsburg boasted the same setlist, to some disappointment, it had the exact opposite feel of their Bowery show. Where the Bowery show was more impressive in terms of the sound, the band was visibly more excited about playing in their home borough of Brooklyn (“We parked right outside,” Keating commented). And while the Bowery set started strong and found the band looking a little exhausted by the time they reached “2080,” they seemed to hit their stride mid-set at Music Hall. Regardless of what one thinks about the new direction of Odd Blood, Yeasayer is truly a band that is consistently working on producing the best live show possible – and they deliver every time. Click the jump for the setlist, more T-Sides photos & more info. 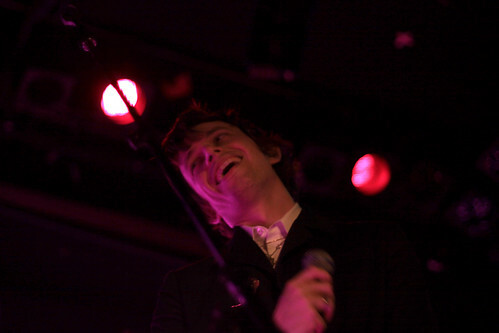 All photos from Bowery Ballroom, taken by me. See the full set here.